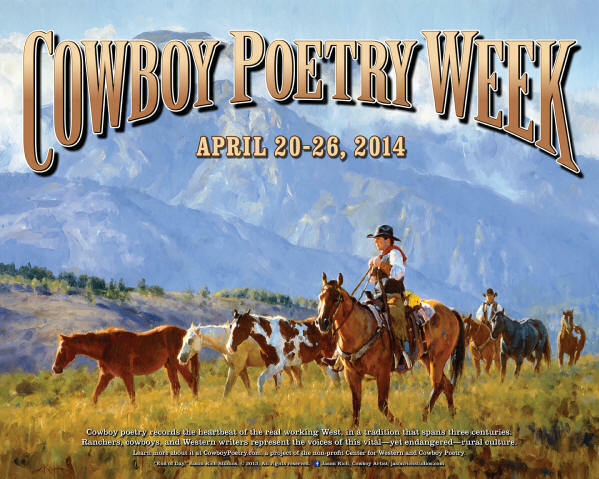 Cowboy Poetry Week, 2014 . . . April 20-26. This is the thirteenth annual Cowboy Poetry Week. The posters are available, as are the poetry CDs they put out each year, by becoming a supporter of cowboypoetry.com. My friend, and fellow quilter, Yvonne Hollenbeck, is gonna be on the radio on Tuesday afternoon, April 22. You can listen to it live from the internet by clicking HERE. 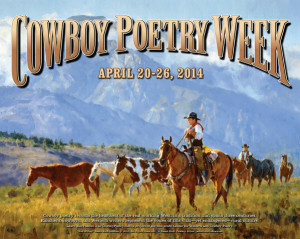 Check with your local library to see if they have any Cowboy Poetry Week activities going on, and click HERE for a lot more information on events that are happening around the country in honor of Cowboy Poetry Week. You just might find a gatherin’ in your neck o’ the woods! Just enjoyed 30 minutes or so of reading cowboy poetry at the website. Loved Angels in the Moonlight. Go take a look for yourself – if you like to emotions set to words.